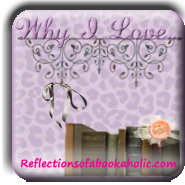 This topic has appeared in one of my first Why I Love Wednesdays post. And I couldn't help but describe how much I LOVE LOVE imperfect characters. This time around, I just have to tell you how much I love sassy and/or witty characters. I felt like I have to include both because sassy just isn't a very masculine description so I had to include both. Some people like their characters to be a bit angsty and others like them to be swoon-worthy. Me.. I like sarcasm and wit. I love Katniss, Peeta, and Haymitch from the Hunger Games. Without the witty interplay (and Peeta), that series would be beyond depressing. Well it was still tough but these characters created fun and smiles in the midst of...gore. Anybody watch House (the TV show)? Okay that's certainly not a book. I LOVE him. He's so MEAN, but witty! I want to be mad at him but I'm so...impressed. Okay back to books. I Love Morrelli and Ranger from the Stephanie Plum series. They aren't over the top but they always have a witty comeback to match Stephanie's sassiness. Ahhh!!! It's so hard to explain. Yet I know it when I read it. Witty characters balance books about difficult topics, the dialogue makes me laugh and smile, and the writing in these books tend to be better than most (in my opinion). Some books try to be witty and others just ARE. These characters are definitely my favorite. Which types of characters do you love? Feel free to create your own post and link up. Don't want to create an entire post? Tell me your favorites in the comments. Thanks for stopping by for another week of Why I Love Wednesdays! !